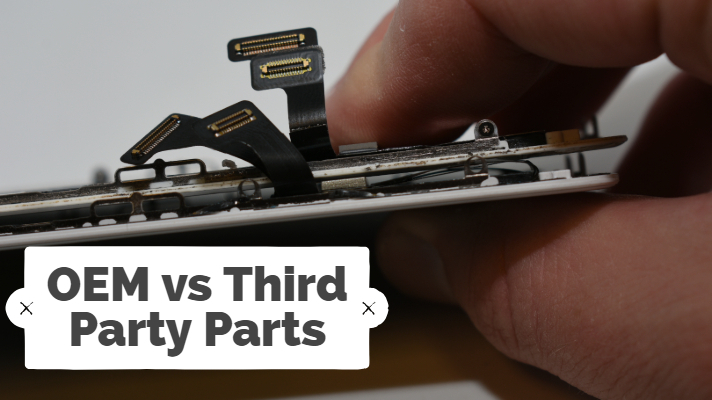 When performing repairs on devices you still need to decide how you source your parts. There are pros and cons and it takes time to find the right providers of parts to meet your needs. When finding out who to source from and what to use it helps to know what kind of profit/expenses you are working with as of course, third party parts are cheaper but they might bring new issues or lower quality outcomes. For example look at this image, can you figure out what is different? one has an original screen/display the other has third party making the display bulge out of the frame. Sure whoever did the repair might have saved some money but now the end result/product is less desirable and certainly lacking in quality. Same phones from another angle, it is a subtle difference but if you are aware and looking for it you can identify that that phone has a third part or less than ideal quality repair. Some companies do have premium parts to repair devices that closely or identically match specs of the manufacturer. It’s important to keep a solid quality checking protocol to catch any issues like the screen offset mentioned above. Another defect caused by the lack of quality in the build of the repair part (in this case) is a hotspot on the screen (see that rainbow discoloration to the lower right of the finger touching the screen) A part of the internal component is creating pressure against the display making distortions when a user touches the screen normally. It may look alright as-is but once it is fully tested and used it’s clear there is an issue with the device. Original parts may be the highest quality possible but they often come with greater to unpractical cost. Third party components can require some extra hunting for the right manufacturer to find the right balance of savings in cost vs quality.